Hi, I use SheepShaver to always be able to play Civilization II. In my old build, on Mac OS 6.8, the CD will not be recognised, but I copied the CD to the hard drive and was able to play without the movies/multimedia additions. I was OK with that. I tried to install my old SheepShaver build on my PowerBook with Mac OS 10.10, and the game loads, but quits all the time. Haven't had time to look into that as of yet. So - now I checked if maybe SheepShaver had been updated, and could be installed on my MacMini Mac OS 10.12. By trial and error I managed to install SheepShaver by using the old install first, before seeing that info in the instruction manual here, but now I'm stuck. Civilization II needs to be installed, before it can be used. I can't install it on the "hard drive/system disc", as it is locked. I'm not allowed to install it on the Unix disc, because it's a "network disc"... I checked my old installation, and I had a virtual extra hard drive with it on. So I created a new virtual hard drive, and hoped that the problem was solved. But now I'm told that I can't install Civilization II on that drive, because it does not have a system folder... I'm not able to install a system folder to my new virtual disc (the virtual installer hangs), and if I remove the "hard drive" and initialise it - I suppose it will be locked? Your "hard drive" with the System Folder on it should not be locked. Did you use a OS9 image with pre-installed system like the one that can be downloaded from Redundant Robot? That image file should not be locked. The instruction to lock the image file is for a system install CD image. The 'Unix" drive is for exchanging files only, not for installations or running applications. The game installer will want to install files in the System Folder. If you use an OS9 image with pre-installed system, there is very little room left for additional installations. When those files are only small and if the image with the SystemFolder is unlocked, it may be possible to install the game on your additional volume. The installer will then install only the files to be installed in the System Folder there, and the other files on the additional volume. Better is to not use a pre-installed system, but to do a proper new MacOS installation from an install CD image onto a new disk image that is large enough for additional installations. I downloaded the new SheepShaver for 10.12-10.14, but it would not open to let me see the blinking disc with a question mark. After I while I tried to install my old SheepShaver install files that I use with my MacOS 10.6.8, and after some trial and error I got the blinking disc, and changed the links inside in preferences. When I tried to solve my game install problem, I saw in the info here that there is some kind of error, that prevents a new SheepShaver to be installed in 10.12, and that you have to use some kind of work around of the type I did. Or at least, that was as I understood that info. I did try to make a new drive, and install a new system to it. The drive is no problem, but I can't get the system install to work. I've had ISO, DMG and CDR versions of the recommended system disc from Macgarden, and I tried both to reach them from the Unix drive and added them in preferences. But the install halts very quickly on the task bar, at the stage of preparing the install, and then the time left starts to count up without the task bar moving. I also tried the installer on the locked system drive, with the same result. I even tried to just move the system folders from the small system drive/folder, but something is missing, and it won't boot from that drive if I change the startup drive, and it does not trick my game installer into thinking that the new drive has a systems folder. Would it be a good idea to look for an old Carbon copy cloner? The system drive is very small, but Civilization II is happy with putting just a few KBs on it, so I think it would would work if it wasn't locked. I don't remember how I did it on my old MacOS 10.6.8. I can only see that I moved the contents of Civilization II to a new drive. But maybe the system drive was not locked then. If I get this to work I will make a disk image of my Civ II CD, and finally reacquaint myself with the multimedia parts again! I still have a very old G4 that can run it - but those computers made such an insane amount of noise! You write about many different issues making it difficult to respond. 1. If you have an existing setup and simply replace the old SheepShaver application by a new one, it should work. The issue with 10.12 and later macOS versions does not apply in that situation, because you already moved the new application manually to where the old application was. In some configurations the system installation may stall at the very beginning while "Updating Apple hard disk drivers". It seems to happen especially with some system install CD disk images. Then start again, but in the screen where the actual installation can be started (usually the first screen after the software license agreement), click the "Options…" button and uncheck the option to "Update Apple Hard Disk Drivers". Installation should now proceed normally. 4. You can only install the game if the startup volume with System Folder is not locked. Last edited by Ronald P. Regensburg on Sun Aug 05, 2018 9:33 am, edited 2 times in total. I picked option 2, and I hadn't seen that manual before. Without the preparation/updating the installation went smoothly. I put my new disk, now with a system folder, at the top of the list in Preferences, and removed the former system drive from the list. That works so-so. The old system drive continues to load everytime I start SheepShaver, but I can't see it in my installation or "Unix"-folder (or in the list in Preferences). First try to install Civilization 2, it made the same complaint - "no system folder". I changed start up drive, and got the unresponsive grey desktop after restart. I tried to find my old system drive via Preferences, and that action made the emulated Mac wake up again. But every restart of SheepShaver it reloads this lost system drive. However - I also did a second try to install Civilization 2, and this time the system folder was recognized, and the game was installed. No audio though. I will try to look through the manuals here, to see if I can solve it. Never was a problem with the audio in my other setups of SheepShaver. Regarding option 1 in your answer: I may have misunderstood something, but as I said I did not move an existing setup. I tried to do a fresh installation on a new computer with Mac OS 10.12, and SheepShaver instantly quit until I tried my old, untouched installation files that I used for the installation on an older computer. Which, as far as I could see, is the advice that is given in the pinned post in this forum. Those were answers to different questions, not different options. A webloc file pointing to the setup manual is in the 2014 download and the manual is listed in our wiki. If the old system drive is still mounted each time when you run SheepShaver, you must have done something wrong managing the volumes list. Yes, that was the manual I used, but SheepShaver refused to start (it did superfast start and quit), until I started using trial and error with my old installation files. On the notion that perhaps they would work anyway, on Mac OS 10.12. And yes, something has to be wrong with the installation, as I had to improvise. I used the "remove" button in Preferences, to remove the original system drive. Then I also removed the virtual system disc, so that the bootable new drive would be on top of the list, and added the virtual system disc again at the bottom of the list in Preferences. I will be away all day, so I can give no follow up soon. I see two disks in the prefs. I suppose the "New.dsk" is the one that you created yourself. What is the "Mac OS 9.iso"? The name suggests it is a system install CD image that you got somewhere and not a pre-installed system as I supposed before. New.dsk is the generic name I didn't bother changing when I created a new volume in Preferences to put the system folder on and install the game on. Mac OS 9.iso is the virtual system disc, that is linked via Preferences. I have it in the SheepShaver folder, to try to keep the files together a bit, and not spread out over the whole computer. As far as I understood the installation guide, I need a ROM file and a virtual system disc to make SheepShaver work. (And that is also what I needed, when I made my former installation, on MacOS 10.6.8.) My old installation had a virtual system disc that was .img, but the new SheepShaver wouldn't accept it, so I made a new one with the .toast file from MacGarden. - You apparently used a install CD image that you downloaded from Macintosh Garden, not a pre-installed system as I first assumed from the way you described your situation. That makes all directions I wrote above not applicable. - Exactly which one of the install CD images presented there did you download? - There was no need to create an .iso image out of the .toast image, you could have used the .toast image as such. - You should not copy the System Folder to the new volume as I described above. That description applies to using a pre-installed system image, not to a install CD image. Instead, the install CD image file does indeed need to be locked and you need to run the installer on the install CD volume to install the system onto the new volume. All as described in the setup manual. I used the CD image with the exact name that was recommended in the manual here. I didn't know that the .toast image could have been used, but the .iso made with Disc utility must have the same content. I already did install the system on a new virtual drive, as I have described, using your valuable advice to remove the "updating Apple hard disc drivers" option. And yes, the CD image is locked, otherwise it will not load. But my problem was that the virtual system drive was locked, which prevented me from installing my game on my new virtual drive. The issues that remains are that the original Mac OS 9 drive won't disappear, though I used the "remove" in SheepShaver Preferences, and that I have no audio. I've not had time to experiment with the audio error info here yet, so I don't know if I can solve that. I tried to use the exact setup manual, but it didn't work, so I tried my old, untouched installation files. I then saw here that the setup manual doesn't work with MacOS 10.12, and that using old installation files to get it going is recommended, which was what I did, by trial and error. I have most likely "trialed and errored" wrong, as this new installation is not by any means perfect. Well, apparently you did not remove the volume from the list properly, as it still appears and it is still listed in the preferences file that you posted above. In the volumes list in preferences, select the install CD volume (select the line, not the box), click the Remove button, click Save, and quit SheepShaver. At the next launch the volume should not appear again. Last edited by Ronald P. Regensburg on Fri Aug 10, 2018 9:07 am, edited 1 time in total. I don't understand. I thought that the virtual CD was supposed to be in the list. I have written here that I manually added it again to the Preferences list, below the new virtual drive. If that is my only problem, then everything seems to be about right with my current setup. OK, I tried to remove the .iso. SheepShaver loads, but I lose contact with the Unix drive. So, it's back on the list, no problem. The audio is still gone though. I have not find anything in the forum that is of any help. Inside SheepShaver the audio volume is at max, and can't be moved. But in the Control Pane inside SheepShaver the audio volume is at "off", and can't be moved. Both of these remained while I was trying to get by without the .iso virtual system CD. Seems like there could be a conflict there. And in Mac OS 10.12, the mother host of this SheepShaver, I can't even find a switch to 44.1 Hz, which made that other guy happy and restored the audio in SheepShaver. Can anything be done to remedy this? I suppose you did not perform the removal correctly. After removing the volume from the list and saving that change in preferences, it is essential that you quit SheepShaver. After any change in preferences SheepShaver needs to be quit, shut down completely. At the next launch SheepShaver reads the changed prefs. You do not write whether you followed the instructions about enabling audio. In Audio control panel you need to select select "built-in" for the output device. You need to actually click on the text "built-in" to highlight it. Whether that switch exists depends on the Mac hardware. If your Mac can produce 44.1kHz audio only, and that is probably true for your Mac mini, it does not show that switch. Yes, I know that changes only apply after restart, and what I described happened. It makes no difference highlighting "built-in". Still can't move it. Thank you for the MacMini info - explains why I don't have that switch. However, I tried to play a bit, and something seems to be really wrong with this setup. So I'll just scrap it all, and try again. I will let you (the forum) know how it goes. 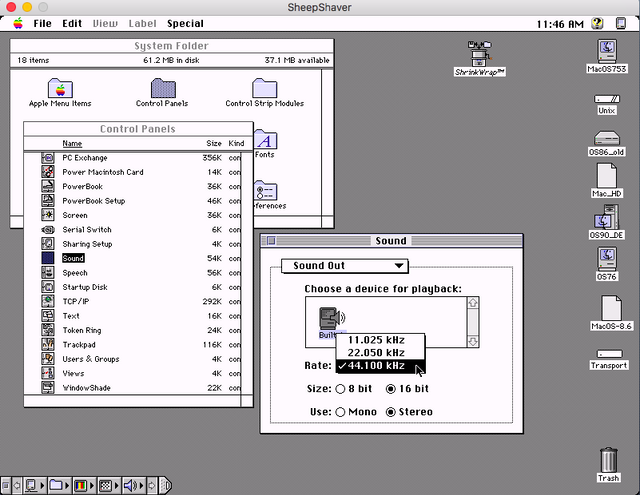 Maybe you would like to boot SheepShaver with System 7.5.3 (once free from Apple) and the 4MB OldWorldROM? The Sound control panel is located in System Folder/Control Panels. Enabling Sound there will let you have sound in all of your SheepShaver MacOS you choose to set up. Not "restart", but quit and launch again. When you do not do that, you will typically get a message that the UNIX volume cannot be found. That you cannot move the volume slider is normal in SheepShaver. The sound volume is set on the host. After selecting built-in for the output device, sound should work and you should be able to choose an alert sound and set a (relative) volume for the alert sounds. Anneli referred to another poster who could not enable sound in SheepShaver because he had sound sample rate on his host Mac set to a higher than 44.1 kHz value. The Mac mini does not support that feature.